I ultimately decided on a variation of the sandwich approach. I went with butter instead of peanut butter because, while I am hoping for an engaging presentation, I’d prefer to avoid one that requires an Epi pen and ambulance. Thanks to feedback from a colleague before the presentation, I made it a point to modify a couple of slides and points to reference women in IT. Women are just as capable as men of excelling in this world, but there seems to have been a decline of female IT personnel over the years. I have 3 young women who will be spreading their wings soon, and I want them to know that they are free to pursue whatever interests or callings they have. I wanted to find a fun, catchy name for my presentation. After all, it’s what sets the tone for what is to come. 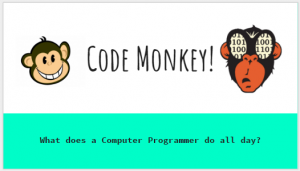 I decided on “Code Monkey”, which is sort of a nod to the song by Jonathan Coulton and a nickname I’ve been given at work. I take it as a compliment and thought it was a fun way to get the kids’ attention. 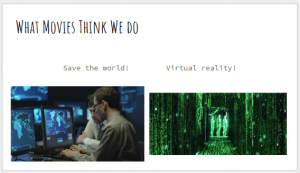 “What Movies Think We Do” – I spoke about the heroic and vastly oversimplified use of computers to save the world. 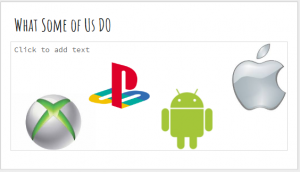 “What Some of Us Do” – I had logos from popular electronics (Xbox, Playstation, Apple and Android). This slide generated some murmur and talk, which segued into the many different aspects of IT. Some enjoy programming, others enjoy the graphics side or designing the game (worlds, achievements, etc). 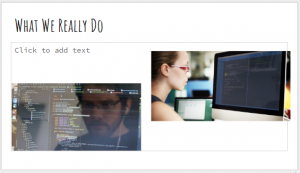 “What We Really Do” – This one showed 2 people in code windows, which is where I enjoy spending my time. But that window could contain graphics and rendering, a Visio layout for a data center or even a digital storyboard. 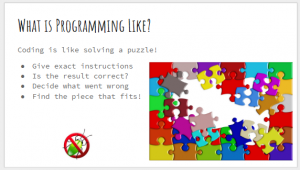 “What is Programming Like” – I like to compare programming, as well as other aspects of IT, to solving a puzzle. Our pieces might be different (code, graphics, plans), but we have to fit them all together just right. Inevitably there are some pieces that don’t fit the first time, so we have to find the “bug” and fix it! 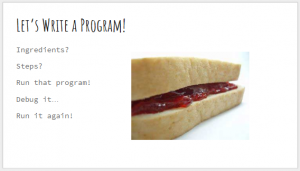 “Let’s Write a Program” – I asked for a volunteer from the audience and we put together some pseduo-code to build a butter and jelly sandwich. This one was fun because we learned how literal computers are. You want to open the bread? You didn’t say how…so the bread is open and everywhere! You wanted to put jelly on the bread, but you never said to open it…so the jar of jelly is on the bread! We refined the program and the “programmer” eventually enjoyed the results. 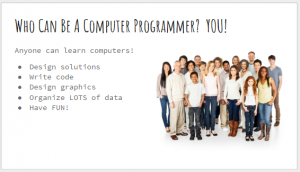 “Who Can Be a Computer Programmer?” – I really tried to focus on the possibilities with this slide. I used an image with a very diverse group of people, and we talked about how anyone can work in IT. Some of the kids enjoyed drawing, so they could be graphics designers. Some enjoyed solving puzzles, perhaps they would like to code. Others enjoyed organizing things, they might like to work with a database. Boy/girl, race, religion…it doesn’t matter. Anyone with a desire and interest can do it! “Where Can You Start?” – I highlighted a few websites with programming resources for kids. 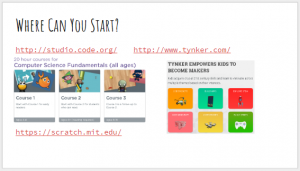 Code.org, Tynker and Scratch are all popular and geared for kids. I saw a few writing the information down, hopefully they follow through. I saw several other presenters that had some small trinkets or samples for the students. A chef brought mini creme brulees so the kids could use carmelize the tops. Another one brought mini tractors for the kids (he was an industrial equipment sales person). If I give this presentation again, I’d like to find some small jigsaw puzzles to pass out. Something tangible to remember the topic! There were only a few questions, which I found surprising. I don’t know if the kids just didn’t think of any or if they were just not engaged. I had one girl ask about salary and a couple kids came up afterwards and said they already wanted to be programmers. I enjoyed giving the presentation and even learned some things while putting it together. I hope the kids learned something as well, and that I had a positive impact! So today is my birthday. I’m officially past the big 4-0. I haven’t done this in awhile, and am not fond of sharing personal info, but I’ve been wanting to get back to the blog and need to start somewhere…so here goes. As time passes, I realize a quote from one of my favorite movies really rings true: “There’s no normal life, there’s just life. Get on with it.” (Tombstone, 1993) Life is far different than when I last posted 7 years ago. During that time, my kids have grown tremendously, I’ve had huge personal changes and I’ve learned that there really is no such thing as a normal life. You can choose to be happy, sad, angry, oblivious or anything in between. It is your choice. We have all made decisions; some we are happy with and others that we want a mulligan. But in the end, life really is what you make of it. Ok, that’s enough. We have a busy summer ahead! With 5 kids to coordinate (elementary to high school age), it gets crazy. The summer camp schedule alone is nuts: band camp, church camp, choir camp, Boy Scout camp, diabetic camp, marching camp. We are also taking a huge road trip to Yellowstone, which has been in the planning stages for at least 6 months. Our summers (and lives in general) seem to get busier every year, but we wouldn’t have it any other way. Life is what you make of it and we are going to have fun! I am a fan of the Dallas Cowboys, they’re the home team and I enjoy watching football. I was excited when they advanced to the NFC Divisional Playoffs…finally some post-season success! Kick-off was at noon yesterday, and we are never home by then on a Sunday, so I setup our faithful DVR to record the game along with an extra hour (just in case…learned this one the hard way). We were careful and didn’t turn on the radio, bypassed the electronics department during a quick shopping trip and did everything possible to ignore the outside world. Google Chrome put it best: Aw, snap. This is one of my favorite times of the year. 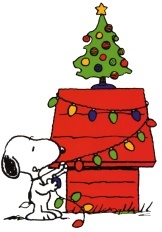 There are so many ways to have fun during this season. Spend time with your family! Hug someone! Make a surprise for a friend! You don’t have to buy something to give a wonderful gift. Since my favorite comic is Calvin and Hobbes, I wanted to share these winter-themed strips…I hope they make you laugh. Thanks to Bill Watterson for coming up with such a wonderful cartoon. I had a recent need for conference calling, and decided to sign up for several services to try them out. Conference calling is a very hot commodity in today’s market, especially during these economic times. You can reach out to so many people for such a small cost, it is logical for many businesses, freelancers and even personal calls. I decided to investigate several options, beginning with the lowest price. There are several free options available, the most notable being Free Conference. How can you go wrong with free, right? If you’re using a service for internal use within your company, a family gathering or some other instance where you don’t mind a stripped down service then go for it. It’s simple to use, but very basic and you have to pay your own long distance. If you want toll-free service it’s 10¢/minute per person, and you also gain access to several features such as call recording and playback. The next option I tried was AccuConference. I love their product and feature set, it really is a great deal. They don’t have a free option, but have inexpensive flat rate plans (you pay long distance to connect) or their toll free plan is only 9.9¢/minute per person. You have access to the same feature set regardless of your plan, which is great. They also offer free call recording, desktop controls, pre-conference and a ton of other features. My final option was Star Conferencing. At 3.9¢/minute per person they were one of the cheapest toll-free option and seemed to still have a nice feature set. I later found out that they are a marketing site forPremiere Global. The rate is definitely great, but there is a catch. You prepay for 500 minutes per month, which amounts to a $19.99 monthly fee whether you use it or not. I found out about this “catch” when a $ 19.99 fee appeared on my credit card statement. I emailed Star Conferencing right away about the charge, I was sure I had not signed up for a plan with a monthly fee. I received a quick response that my inquiry had been forwarded to their billing company. This was the first bad sign because being forwarded is similar to being transferred within an IVR: you are the hot potato that no one wants. Well, just because you can doesn’t mean you should. I canceled my account and responded that I had never used the service or cost them anything, and would they please credit this amount. Their final response was that they made a “one-time exception” and credited ONE of my fees…but the second fee will still be charged because I canceled after my billing date. At this point I give up. I’ve wasted enough time and Internet bandwidth, and decided I would rather blog about it then ask for my other $20. I’ll just keep my AccuConference account and be happy. They don’t charge me anything if I don’t use the service. 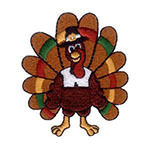 I would like to wish everyone a safe and happy Thanksgiving! No matter where you are in life, there is always something to be thankful for. Stop and count your blessings, you’ll be amazed what you find!